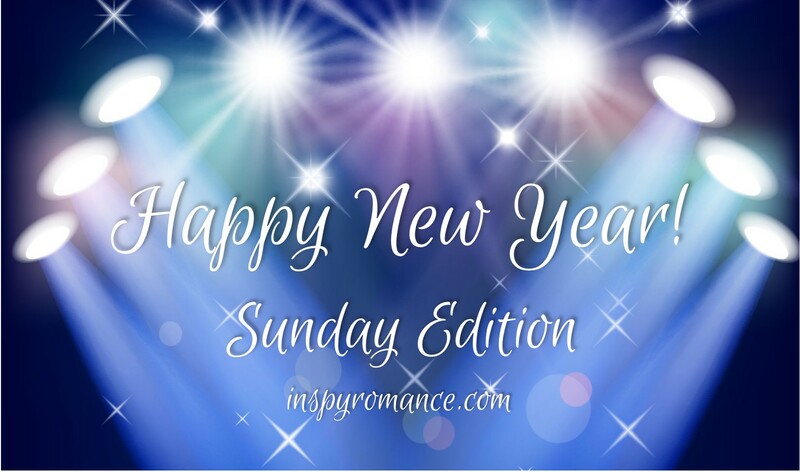 From all of us here at InspyRomance to all of you out there! HAPPY NEW YEAR!!!!! I hope y’all had a great evening – and didn’t stay up tooooooo late or party toooooooo hard! We have some friends who we spend two days a year with every year – well, we see them more than that but we always celebrate the 4th of July and New Year’s with them. There’s ten of us all together and though our kids generally get along well, it can get loud and boisterous. And none of us adults do loud and boisterous as well as we used to :/. They usually leave before midnight so as to beat the crazies on the road home. For several years, we’d set the clocks ahead an hour and watch the ball drop in Times Square and call it good. Then our oldest two caught on (their oldest is 11mos older than my oldest and they’ve been friends since mine was born). They helped us keep the charade going for another year or two then too many kids had their own phones, etc. and there went that plan ;). So what’s your plan for this coming year? Resolutions? Words of the year? Detailed plan? I’ll be talking about some of that on my personal blog soon, and about other fun stuff here this week! I’ve missed seeing y’all every weekend, but you get me for the next few :D.
So… what’s been going on around here? Janet Ferguson gave away a copy of Ordinary Snowflakes by Jennifer Rodewald – Mandy… you’re a winner! Monday: Sally Bradley, Happy Day After Christmas! – the winners are… Winnie Thomas and Kate! Tuesday: Debra Lynn Collins, Welcoming in the New Year #giveaway – Linda Rainey – you’re a winner! Friday: Autumn Macarthur, “As you wish…” with a giveaway! Saturday: Ginger Solomon, Dream BIG! Happy New Year:) We are visiting family in South West Queensland- it is HOT, but sooo nice to be with them. They live on a property with horses to feed, cows to milk, eggs to collect- my boys are loving it, and I am loving the fresh eggs and homemade butter! Unfortunately, tomorrow we begin our long journey southwards, back home. Our family are so spread out over Australia, that it is such a blessing to spend time with them when we can. New Year’s- to trust that God will continue to lead and guide, that we cherish our boys and point them to Him, the only One who matters. Happy New Year everyone! I was in bed at 9:20 and asleep way before 11pm. But I hope everyone had a great night. Happy New Year to all – authors and readers! Looking forward to many inspirational blogs and romances! I’ve got a horrible cold. What a way to start the new year!